How to get there: Take Maroon Road (marked by sign) from the main traffic circle just outside (north) of Aspen (On the main road, US 82, in the direction of Glenwood Springs). The upper part of this road is often (all summer) closed to private vehicles in the period 0800 to 1700, but any serious climber should be there much earlier so this has little practical consequence. If you intend to stay overnight in the Maroon Valley you may drive up any time of day, a fee of US dollar 10 may then be charged at the entrance station. The road ends at a clearly marked parking lot. Route description: The (climbing) trail goes left from the Maroon Lake to Crater Lake trail about 1.75 km from the parking lot near Maroon Lake. Alternatively, it took us about ten minutes to hike to this point from our camp at Crater Lake. The place is marked with a cairn and is in a fairly flat area of the main trail, just north of two small (rocky) knolls that the main trail goes between. This smaller trail heads directly towards the high hanging valley below Pyramid. 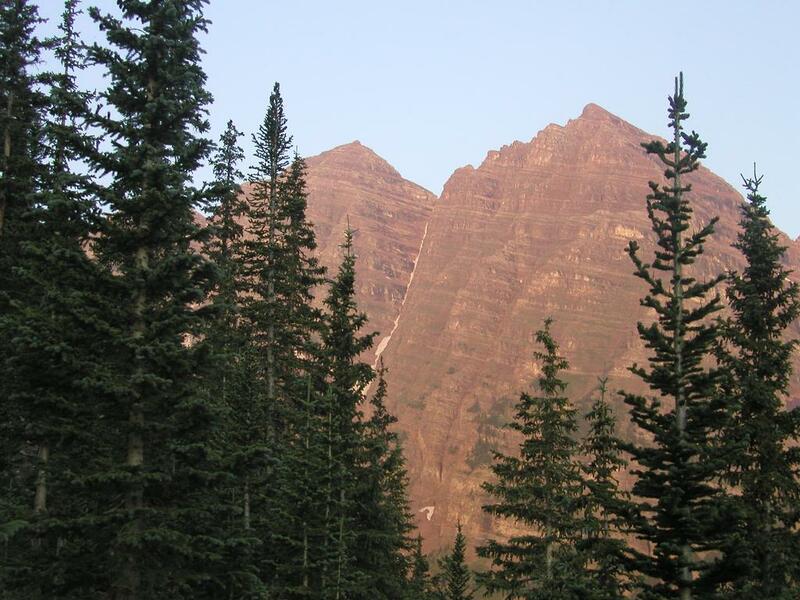 The most recognizable feature is perhaps the towering pinnacle that stands near the valley outlet. After a short fairly flat section, this trail winds its way steeply up between the trees, later in more open terrain, before reaching the upper basin just left (north) of the aforementioned pinnacle. The upper basin has all features of past glacial presence. It is filled with moraines and rocks. To the left (north) there is a big, unstable crater. The route therefore heads up this basin on the right side or sort of mid-valley staying right of a main moraine that runs north-south. Further into the basin, one crosses this moraine and heads for the lower part of a gully system that comes down from Pyramid's North-East ridge. There are several trails leading upwards. We started out following the left edge of the gully, then ascending towards the right as the steep gully reaches a somewhat less steep intermediate area before entering the final gully that tops out at the lowest point on the north-east ridge. However, when descending we observed substantial rockfall coming from the upper part of the ridge and actually hitting the area we had used for our ascent. 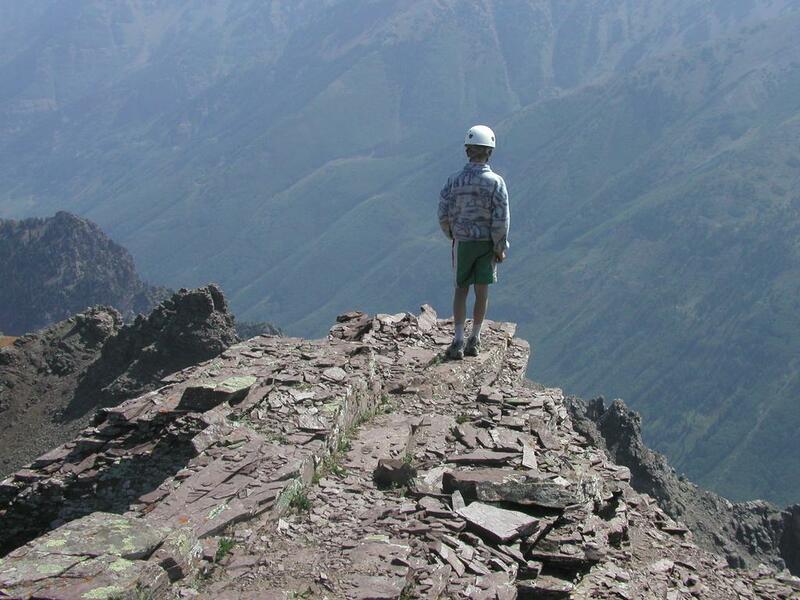 It is therefore likely better to ascend further to the right already from the base of the gully. The saddle or lowest point on Pyramid's north-east ridge is located at North: 39.04.528, West: 106.56.707. 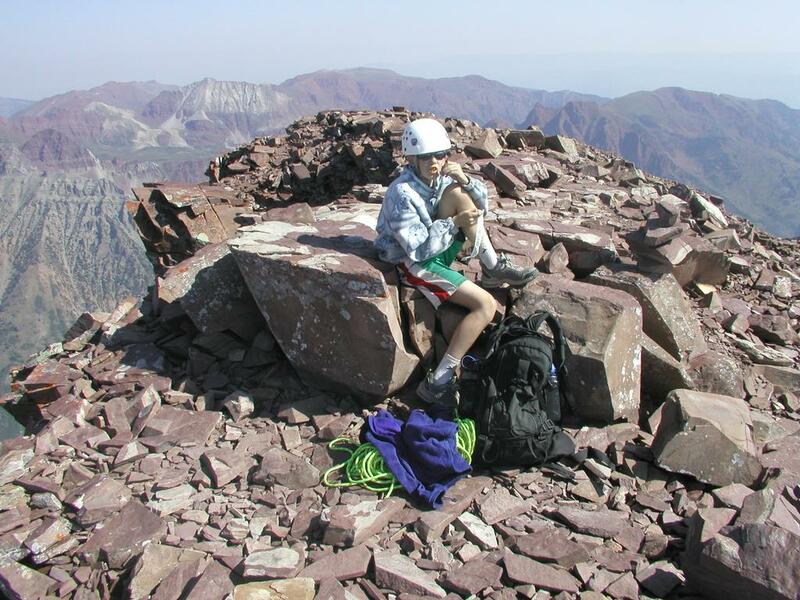 From the saddle, one should hike along the top of the ridge. There are also some paths going on the side of the ridge, first on the right, later on the left side, but it is likely equally good and a bit more fun to stay on the top of the ridge as much as possible. This ridge is pretty flat on the top and pretty easy to hike along. As you approach a notch, bear right, then through a narrow passage to the left. You will then end up in a gully that starts on the very highest point (in a deep notch) of the ridge and runs down to your left as it also gets wider. The gully is only about 0.3 meter wide at the very top. This is a place for important decisions. The crux of the route is to climb this wall. There are several options. There is a very narrow crack going straight up. The main difficulty is to get into this crack, it may also be too narrow for many people. 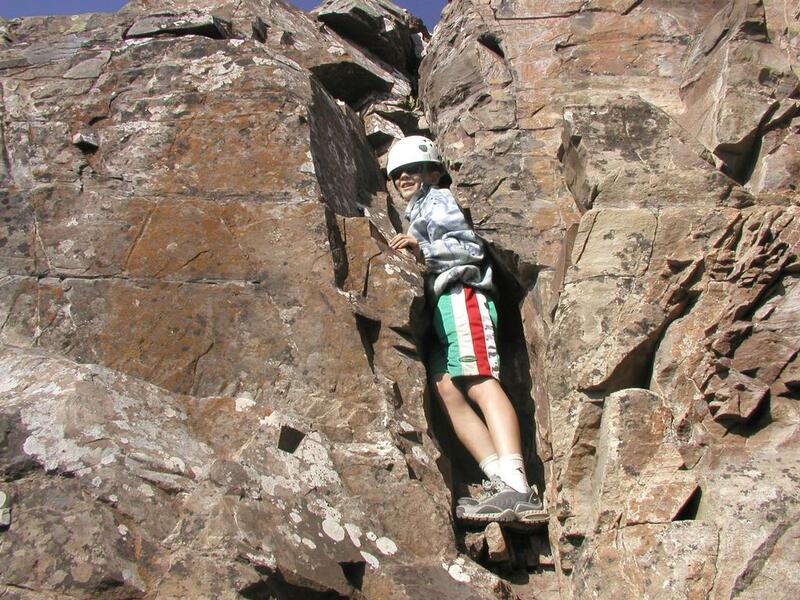 (Pål Jørgen, age 13, climbed straight up this crack.) A bit up the crack one could possibly exit left out on a narrow ledge and complete the climb from there. There is a possibly even better alternative to climb from the very top of the gully. The route up from this point has distinct hand and foot holds, but also a bit more exposure down the narrow gully going north. There are also cairns further down the south facing gully, it seems like some parties just contour below the cliffs to the left and then eventually climbs a steep and unpleasant looking gully that tops out at the next notch on the ridge. A third alternative is to descend a little, then turn around the corner (to the left) and climb straight up on a fairly exposed set of small ledges with loose and unpleasant rocks scattered around. Once beyond this difficulty, continue on the very top of the ridge until an obvious exit to the left that curves out and reaches a new notch/saddle in the ridge. This place is also the top of the gully that runs down on the south side and that many people seemed to have used to circumvent the crux wall. The route now continues across and up white colored rocks, then climbs a few small V-shaped rock steps and continues on ledges back to the main ridge. Follow the main ridge until it gets more difficult and a cairned trail exits to the left. Scramble up and around a small corner to reach a small bowl just below the main summit. From here the route is obvious and quite easy. Comments: I did this climb with my son Pål Jørgen. We started at Crater Lake at 0540, 10 minutes later we left the trail between Crater Lake and Maroon Lake and started the ascent towards Pyramid Peak. It took us approximately 2 hours to reach the Pyramid North-East ridge, we were at the summit at 0950, after 4 hours and 10 minutes. We spent 15 minutes on the summit and returned to the north-east ridge saddle in about one hour including a rappel of the crux wall. Return to Crater Lake at 1310 giving a total descent time of 3 hours and 5 minutes. Total trip 7 hours 15 minutes. Pål Jørgen climbing the crux on Pyramid Peak.